Jaded Blossom: Guest Designer, Sarah! Hi Sarah here from Simply Sarah. I am so happy and honored to be one of the guest designers this month to help Jaded Blossom celebrate their birthday! I love all of your products and cannot wait to see what next year brings for the lovely Jaded Blossom. The project I chose is a 3 parter sort of telling a story. On Christmas eve, before going to bed Little Miss Paeton Decided to leave Santa some "hot cocoa to go" so he had something to take on his long chilly night with him. After santa came and went Christmas eve, Little Miss Paeton awoke to find a tag thanking her for his goodies. Aparently Santa isn't a fan of egg nog. It looks like he left a special present for Paeton's dad. I wonder what it could be. There was laughter all around. What a GREAT Santa gift idea! LOVE the added jar of coal!! How cute! I love the jar of coal! Such a really cuuuuuuttttttteeee idea! I especially love the coal for dad! HAHAHAHA! I should of done for that for my hubby, lol!! They're all terrific, but the coal project cracks me up. Awesome project! Love it! I say every year I'm making it and never do. Super cute idea! I especially like the gift left for her dad! I love the jar of coal! Great ideas! Thank you for all the wonderful comments! and especially Thank you to Jaded Blossom for picking me to guest design. It was a lot of fun! LOL!! I bet everyone (but Dad) got a good laugh out of that! :0) great projects!! WOW! What great projects...Love them all! What a fun project and story. Building memories for your little girl. Thanks for sharing this awesome project with us today. SO cute. Love, love, love it. I will have to keep this stuff in mind for next year. I love the hot cocoa jar! What a cute idea! Holy Awesome-ness!!! I absolutely love everything about this post!!! Excellent job! This is was too cute! I love the jar of coal! Cute ideas! I love the coal! So cute. I agree on the eggnog! Love the coal. Great job on all the projects. TFS and thanks for being a guest designer. Love this! 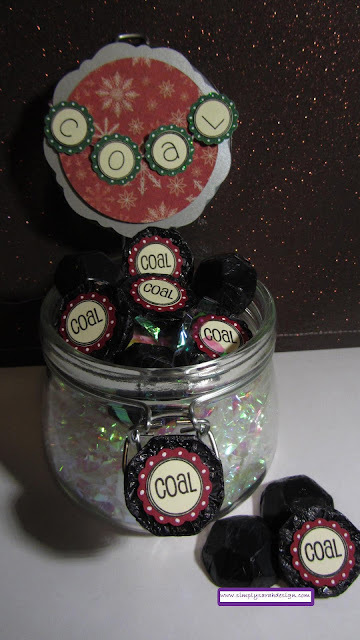 Love the jar of coal! Great post! 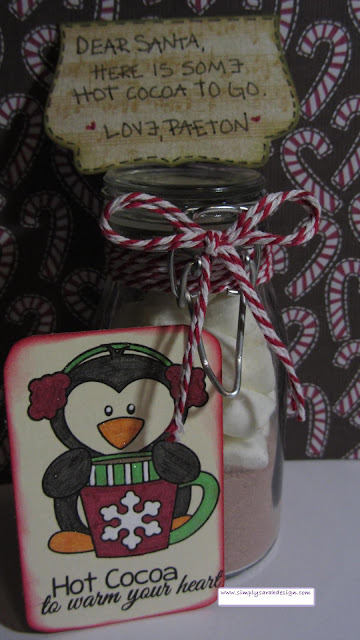 Cute hot cocoa to go...the whole project is cute. Too darn cute! Wish I could find some "coal" around here! TFS! Great job! Love all your projects and awesome idea for small children! super cute. love love this. I love the cocoa set! The coal is perfect too! Awww, I so love these projects! That coal is hilarious! Thanks so much for sharing! I just love these projects! They are absolutely fabulous! Thanks so much for sharing such great talent! I love your projects! So much fun! Special Monthly Challenge: Crafters Choice!